"STRAWBERRY CREAM FOR THE FOUNDATION AND COVER"
By massaging a small amount of Crème à la Fraise, in a white porcelain jar with a small strawberry molded on the lid, this would moisturize and freshen the face. Porcelain pot decorated with the Guerlain emblem of the "woman with flags" and titled "Guerlain Perfumer Patented SGDG" and "Rue de la Paix No. 15." 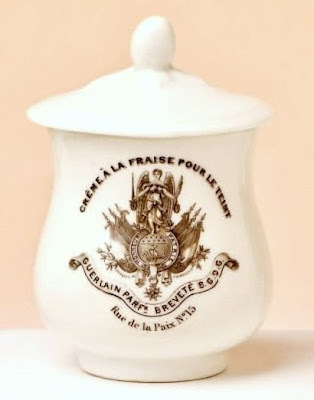 Circular lid, topped with a figural strawberry finial. Measures 2.36" diameter. Introduced in 1880. 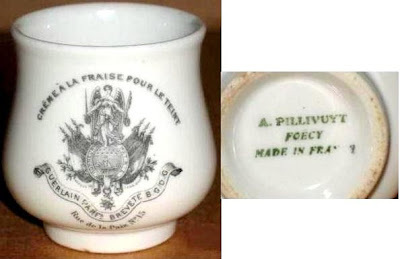 Marked on the bottom "A. Pillivuyt Foecy - Made in France".